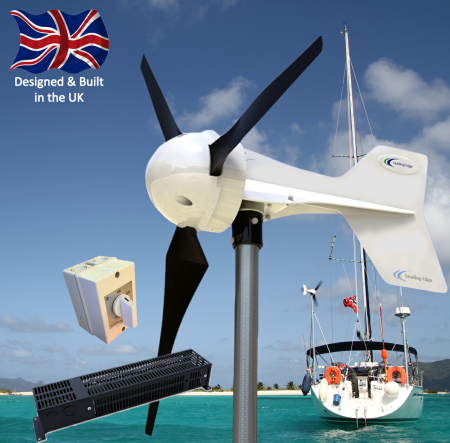 Perfect for a wind only system or basic hybrid system on your yacht or sailing boat, this LE-300 Marine Wind Turbine Standard Kit contains everything you need (except batteries & cables) to get up and running as quickly as possible. Based on our most popular wind turbine, the LE-300 Marine from Leading Edge, it also includes the DL-300 diversion charge controller and a stop/start switch to be used when you want to stop the turbine for maintenance (not to be used in high winds). The marine version of the LE-300 is fully marinised and designed for use in salt-water environments and on boats / yachts. Among other modifications, the LE-300 marine has a stainless steel counterweight fitted to the tail to reduce the effects of 'pitch and yaw' on turbine performance. The wind turbine is connected directly to the batteries and the DL-300 charge controller is also connected to the batteries. 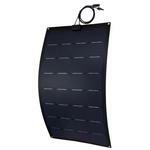 When the batteries are fully charged, the controller diverts excess power generated by the wind turbine into the DL-300's resistor, dissipating the power as heat. Mount the turbine on a standard scaffold pole (48-50mm outer diameter).